Orthomega® Select DHA is a powerful omega-3 concentrate that provides targeted support for healthy blood pressure and blood lipid levels. While EPA/DHA combination formulas remain the backbone of any fish oil regimen, as research on fish oil continues to accumulate, new evidence has emerged supporting the value of unique formulations of high-intensity DHA for more targeted uses. Fatty acids in the n-3 family are considered essential to humans because the body unable to produce them. Extensive studies have shown that DHA from fish oil plays a special role in cardiovascular health, specifically important for maintaining healthy blood pressure and supporting optimum lipid levels. DHA also boosts cognitive health and is an essential part of the structural integrity of the central nervous system making it a key component of neurological wellness. 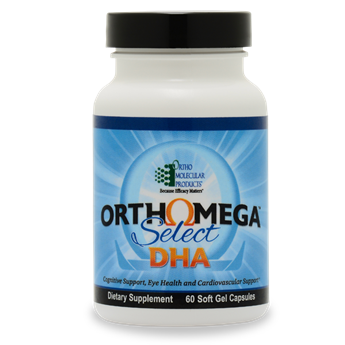 Orthomega® Select DHA is a high-concentration DHA fish oil and a potent formula for those needing intensive nutritional support from this essential fatty acid. DHA is a fatty acid well-known for its role in cardiovascular and cognitive health, as well as boosting mood, memory and focus. It is sourced from waters off the Chilean coast, where cold, fresh waters provide the cleanest, most sustainable source of fish in the world. Now available with a pure lemon oil flavor, each soft gel delivers 580 mg DHA in the natural triglyceride form for superior absorption. This high-concentration DHA fish oil is purified, vacuum-distilled, and independently tested to ensure heavy metals, pesticides and polychlorinated biphenyls (PCBs) are removed to undetectable levels.